Day 9 : Wed 30 May : Marseilles, inter alia to see Rupert onto a plane after lunch. 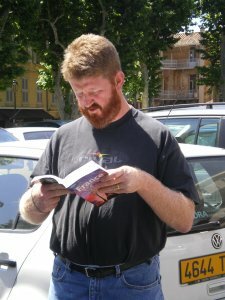 In spite of a very good write-up in the guidebook, Aix didn't impress us all that much. Quite pretty narrow streets filled with all the usual shops. A cathedral that was probably quite good but which shut for lunch so we missed it. The usual quotient of overblown statuary and ornamental fountains. A museum of tapestry which actually only contained one set of tapestries and a random selection of theatrical bits and bobs. 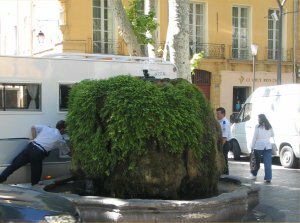 And a tree-lined main drag which uses a large rock as a roundabout, into which some guy had driven his camper van. 2) I have no pictures from the inside since I simply assumed they wouldn't allow cameras. In fact it's on a room-by-room basis. 3) I have Humble's postcards. Hopefully this means that he has mine. If so, could you please mail them? 5) BA stick random bits of metal across the backs of their seats to irritate your shins if you try to stretch your legs out. 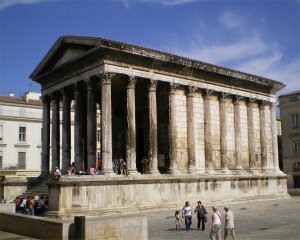 And so to Nîmes. We arrived in time to do a quick recce of the place, and wandered round some Roman remains on which large numbers of teenagers were hanging around. The amphitheatre looked the best bet and so we decided to leave that until tomorrow. So we looked for somewhere to eat. We found a Tex-Mex whose name we forget, which is probably the best thing. After about an hour and a half, by which time the tapas had arrived but the second round of drinks still hadn't, we left a fair sum on the table and cleared off. This being the south of France, we immediately found an Irish pub serving Belgian beer. And as it had, by that time, started to rain heavily, it was obviously completely impossible for us to leave the pub, so we reluctantly had another round ... and another ... and ... well, you don't want to read about us getting pissed again. We'll have something better for you tomorrow, honest.